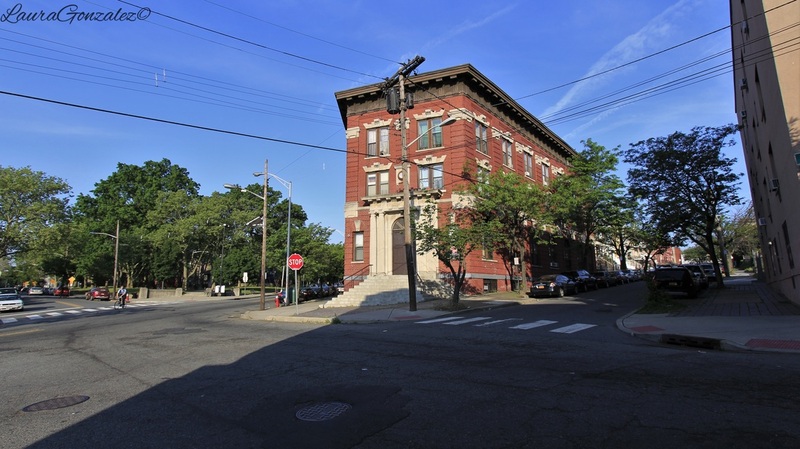 ​At the top of a small hill, at the intersection of Harmon Street and Arlington Avenue, is a five sided building which was designed by local architect Ernest E. Quaiff in 1910 for John H. Ficken. It was originally used as a stable and warehouse. ​Ficken was born in 1840 in Oldendorf, Germany, and immigrated to the United States in 1856(Brooklyn to be exact). 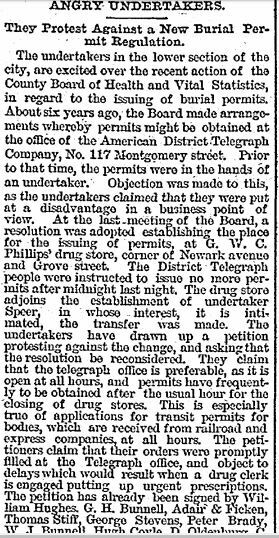 By 1862, he had moved to Jersey City, where he secured a position at a Pullman ticket agency in the Erie Railroad Station. By 1873, he quit and began working for himself. According to the 1883 book "Industries of New Jersey: Hudson, Passaic and Bergen Counties", he was involved with George H. Bunnell since 1880 in the undertaking business. 1883 book "Industries of New Jersey: Hudson, Passaic and Bergen counties "
Reading the statement below "have a number of first class carriages..." it would only seem suiting to be in the livery and stable business. 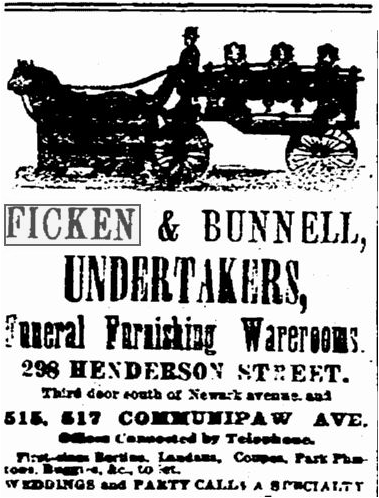 By 1874, Bunnell was gone, as so was Fickens and Bunnell Undertakers. 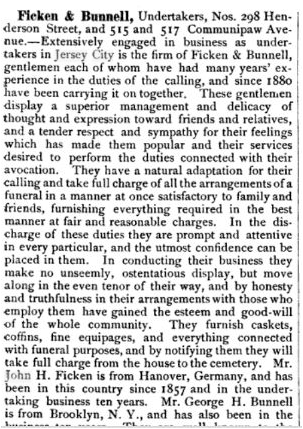 This is seen in a 1874 Evening Journal, describing Bunnell as from the late Ficken & Bunnell. According to my research, he took on a few partners after Bunnell. 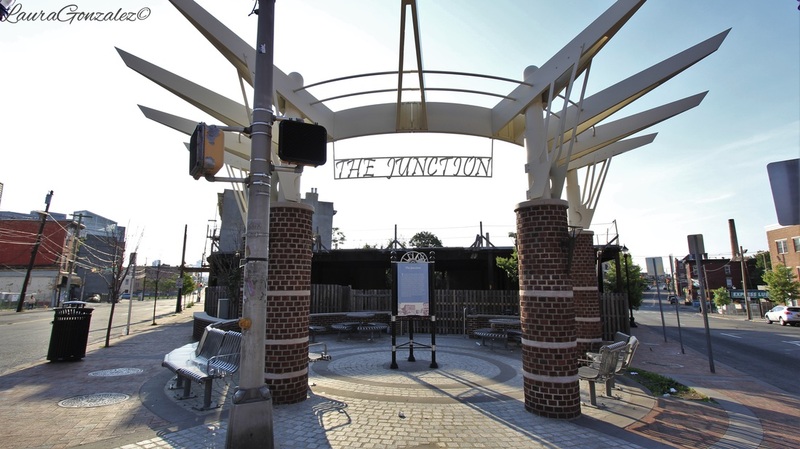 The intersection of Grand Street, Communipaw and Arlington Avenues, was once called the “Junction”, which was a small business center. 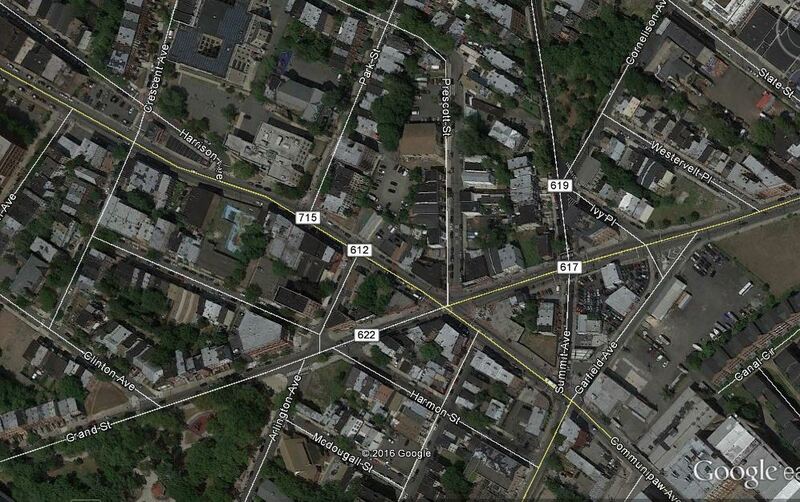 This is the area where Ficken had set up shop. 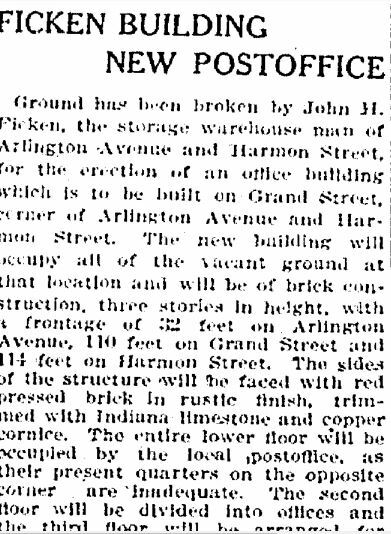 By 1874, with Bunnell gone, Ficken began to expand his business to include storage facilities, and his first warehouse, at the corner of Arlington Avenue and Harmon Street, directly across from a vacant lot. in 1886, new regulations were placed on the issuing of burial permits. This led me to believe the restrictions put on the burial permits is what led him more towards the livery and storage business, and less on the funeral aspects of business. Source: Hudson County 1873, New Jersey Published by G. M. Hopkins & Co. 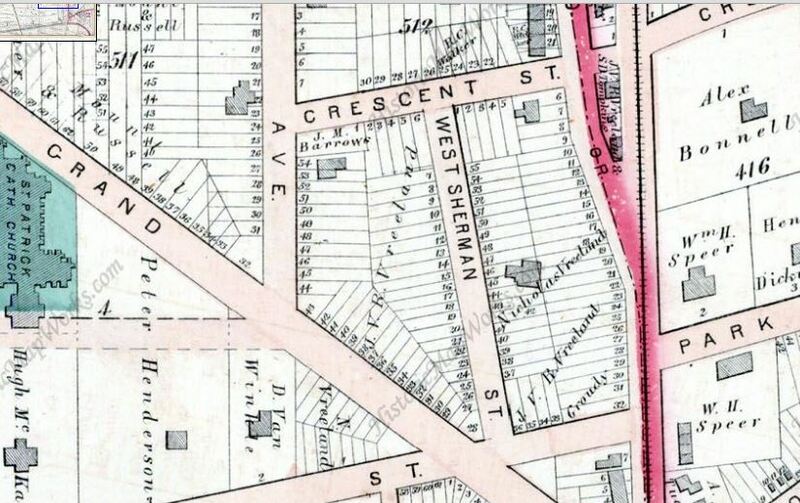 The land on which the warehouse was constructed goes back to the historic days of Jersey City, once being part of the original property holdings of J.V.R. Vreeland. The Vreeland family is one of the original families of Jersey City. In 1906, it was sold by executors of the estate of Abby G. Spring to John H. Ficken. John Ficken died in February 1917. Lena Ficken, his widow, renewed the lease for the postal facilities and by 1960, the the Bergen Station Post Office was closed. Edwin Geils, the son-in-law of John and Lena Ficken reverted the structure back to storage and warehouse use. 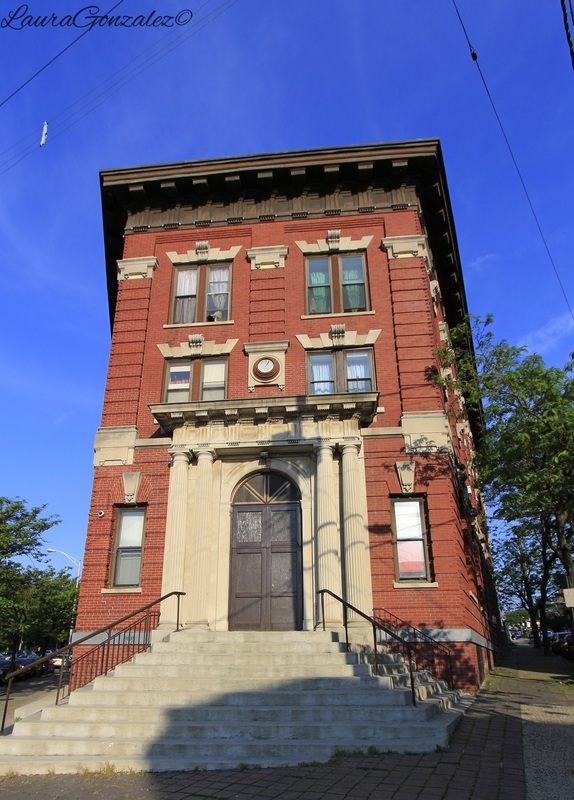 ​The building is now used as housing and has been landmarked since June 14, 1984.